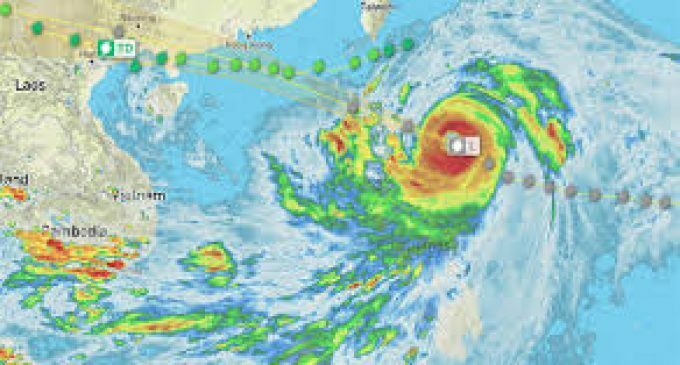 Manila, Sep 15 (IANS) Super typhoon Mangkhut made landfall in the Philippines on Saturday, bringing with it ferocious gale-force winds and pounding rains, as aid agencies warn millions are at risk from rising flood waters and landslides. Mangkhut, the strongest storm anywhere on the planet in 2018, made landfall in Cagayan province, on the northern tip of Luzon Island at about 2.30 a.m., with gusts as high as 325 km per hour, reports CNN. After the centre of the storm passed the Philippines, Mangkhut’s winds slowed enough for the typhoon to lose its “super” status, but it remains a very powerful storm system with maximum sustained winds of 215 kph, equivalent to a category 4 hurricane. It’s now pounding the Philippines with heavy rain, and heading west into the South China Sea towards Hong Kong and southern China. An estimated 5.2 million people are within 125 km of the projected path of the super typhoon, according to the National Disaster Risk Reduction and Management Council. The scale of the typhoon could be felt in the Philippines capital Manila, more than 340 km from the eye of the storm, where heavy overnight rains have led to widespread flooding in urban areas. Mangkhut is on track to be as strong as super typhoon Haiyan, which left more than 6,000 people dead in the Philippines in 2013, though that storm hit a more populated part of the country. Northern Luzon was also devastated in 2016 by super typhoon Haima, with 14,000 houses destroyed and 50,000 homes damaged, according to CNN Philippines. Mangkhut is expected to make landfall early Sunday in southern China. It will make another landfall on Sunday night in western Guangdong.